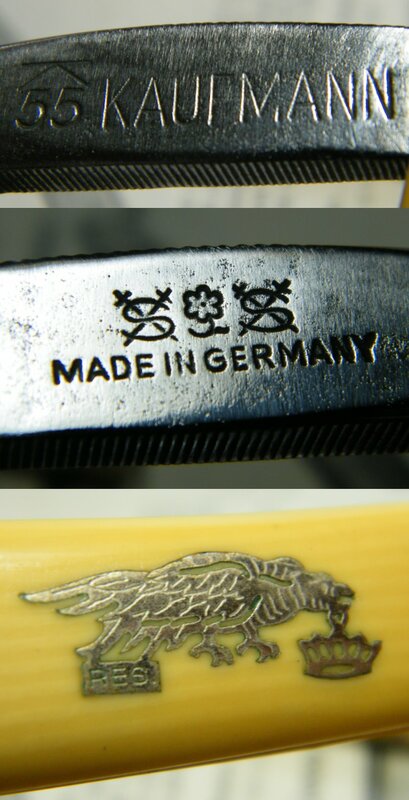 STRAZORS.com - all about classic razors - Heinrich Kaufmann, India-Werk, Solingen. 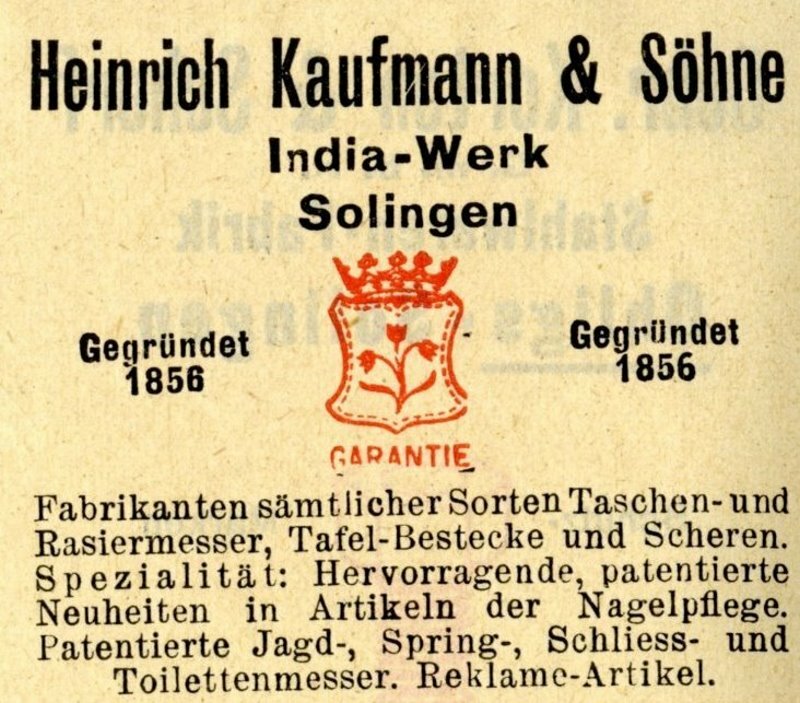 Heinrich Kaufmann & Söhne, India-Werk KG (1972). 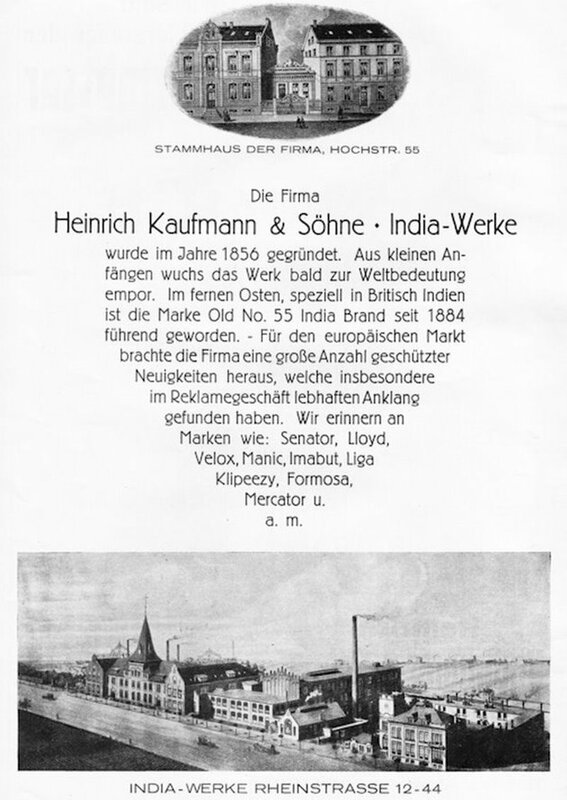 The company was founded in 1856 by Heinrich Kaufmann. Registered 11th September 1928. Located Solingen: Rheinstrasse 12-44 in 1922, Gasstrasse 16-18 in 1939, and Gasstrasse 6-18 in 1971-86. Brand names: 'Aero' (1910), 'Basta' (1916), 'Cabaret' (1909), 'Chile-Haus Hamburg' (1925), 'Circulus' (1905), 'Commerce' (1924-5), 'Coic' (1922), 'Diktator' (1917/18), 'Dixi' (1909), 'Double Kaufmann' (1903), 'Ercator' (1910/11), 'Formosa' (in use by 1922*), 'Hercules' (1905), 'Imabut' (in use by 1922*), 'Indra' (1921), 'Industry' (1924-5), 'Kanzler' (1910), 'Kauf...Mann' (1896), 'Klipeezy' (in use by 1922*), 'Liga' (1910), 'Lloyd' (1905), 'Manic' (in use by 1922), 'Maxim' (1924-5), 'Mercator' (1903), 'Mercatores' (1898), 'Mercaknife' (1924-5), 'Nivea' (1915), 'Old No. 55 India Brand' (1884), 'Prima Bellerina' (1924-5), 'Reva' (1911), 'Ringall' (1911), 'Satrap' (1912), 'Senator' (1907), 'Schwebebahn' (1900), 'Shipping' (1924-5), 'Sieger' (1916), 'Si-Si' (1909/10), 'Soldatenfreund' (1912), 'Spick and Span we show we can' (1924-5), 'Tantris' (1924-5), 'Terminus' (1909), 'Trorpedo' (1905), 'Tosca' (1910), 'Touristenfreund' (1913), 'Trilby' (1910), 'Ut Veniant Omnes' (1904), 'Velox' (1909), 'Zodiac' (1901). 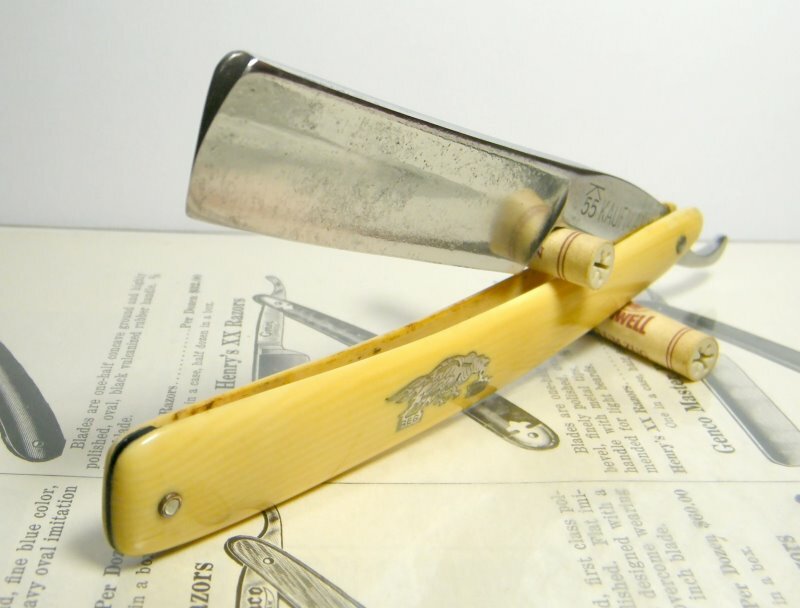 Several versions of the company name were also registered between 1896 and 1911. In 1995 trademarks Mercator and K55K were purchased by Otter-Messer.